Create a warming tradition with our “Award-Winning” blend of cinnamon, cloves, nutmeg, orange, lemon and sugar. 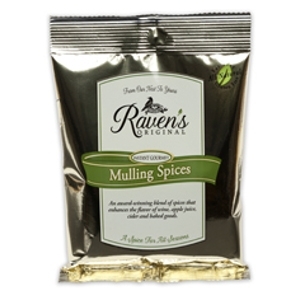 Raven’s Original Mulling Spices instantly dissolves when added to beverages such as juice, cider, wine, and teas. Serve hot or cold! Makes absolutely delicious hot spiced cider or hot mulled wine. Mix with juice (cran-apple and apple), cider, wine, tea or try one of our “Best of the Nest” cooking and baking recipes to find your family’s new favorite! For a single serving, start with a teaspoon of spice to 8 oz. of juice, tea or red wine. You can even add 1/2 teaspoon of spice to your coffee!